I want more towels, or to order room service, but in order to call the right number (some hotels it’s 0, or 9, or 1), I first have to look for the instructions manual in the room, then find the right number and call it. But what if you could just ask for the towels out loud (yes, with no telephone or another handheld device) knowing that room service will receive your message straight away and bring them directly to your room? Voice interaction from back of house, to front of house. Voice is already revolutionizing domestic technology, from mobiles to kitchen devices to cars. It is now set to change the hospitality sector by allowing for a better and more flexible guest experience, from small requests such as towels to event attendees asking about the sessions on the program for an event. On the operational side, voice can help employees do their work faster than they can type. Think about processing a deposit, checking space or updating guarantees. For hoteliers, voice capabilities mean a better allocation of resources to speed up processes and provide better guest interactions. For guests, these capabilities can mean a better and more complete experience. For hoteliers, they can mean a more effective way of serving and addressing their guests’ needs. 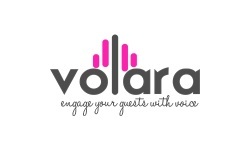 Volara’s proprietary software enables hotels to create remarkable voice-based brand experiences, while improving the efficiency of guest services, influencing guest behavior, and providing data and analytics that will improve decision making. Volara’s capabilities are now available for all Amadeus Service Optimization (HotSOS) customers.